I gave the girls a bath tonight, partly because they were in need and partly because before long they won’t all fit. I love watching the three of them, elbows and knees pointing this way and that, shoulders plastered with slick, wet hair and knotty spines twisting and bending. Their eyes take me back to early day cuddles, hours spent holding them on my knees and learning the contours of their faces, little maps of a future I couldn’t possibly know. Now, watching their long necks, there is no cradling, they can hold themselves up and toss out a steady hand when they start to slip. They do things like hold dolls under a stream of water and say, “With this ring thee be wed,” and press their faces into the water and come up without sputtering. When Fin holds her arms out and says, “I just so a’sleepy, momndad,” I melt. Holding the towel in my arms, I scoop her up and we slip out of the room as the big girls stretch out in the tub. It’s in these moments that I am so fiercely grateful that Fin won’t relinquish the title of baby. I am in no rush to seal this door. “You bet,” I promise as I lay a kiss in her ear. After she’s dressed we go to pick out a book, but tonight she is taken by a stool beneath her window. “I go up and up and up and I catch you to me?” she asks. “Sure,” I nod as I watch her climb. Her feet poke out from a pair of unicorn bedecked long johns, while her arms look like twigs poking out of a size 6 Bowl-for-Kids-Sake t-shirt. The light coming through the window is familiar and I search, wondering what it could be. Fin’s throaty laugh tickles me as she leaps into my arm and climbs the stool again. It is Fin’s light, 8 days shy of her birthday it is the quality of the light during those days when I longed for her arrival. Now, clambering up and down on this felt covered stool, she is nearly two, almost weaned and spectacularly defined in her Finness, “I do it to myself, all myself, ok?” I have mastered the art of letting her advance while preserving the soft edges of baby that she still so deeeply wants. Tonight, I found a selfish reprieve in the light, a moment of grace in acknowledging these last grains of her true baby self before they slip away into the light of her third summer here. And with that, we kissed. Forever. I love your babies. And I hope you never stop seeing them as your babies. Even if they have babies of their own. 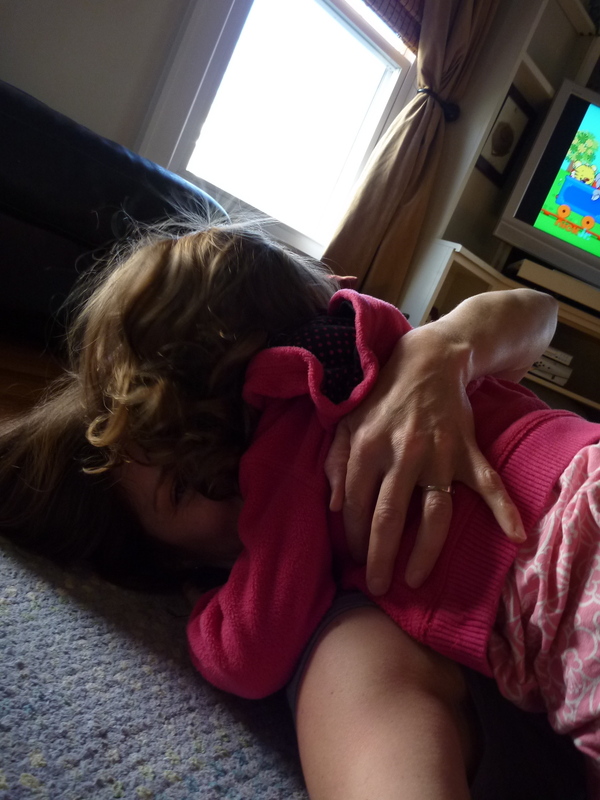 Oh gorgeous – the poetry of motherhood. Gosh, I love this so much! The long, gangly limbs of kids jousting in the bath, sleeping babes and their sweaty curls, and the devotion of a still two year old who clings to their babyhood for those last lingering moments. Oh yes, beautiful poetry that! I feel this too with my own babies. Can’t believe our littlest girls will be 2 soon! Love, love, love this. 🙂 I could be a baby mama forever. so, so, so beautiful! And those girls? Can already tell they have a gift for words that their mama possesses as well! My son’s got eyelashes that curtsy endlessly, too, all day and night. Oh, all this gorgeous imagery! Lovely. Amanda, if we lived next door to each other our girls would just be the very best of friends. Something about our sets of three girls make our lives so very similar. Maybe Fin and Charlotte will grow up and go to college together. Then we can cry together because our babies have left the house.